I Buy Way Too Many Records Dot Com: Unwound - Caterpillar 7"
Maybe we'll do Unwound Wednesday for a few weeks here. I've got a small pile of Unwound 7"s that I bought recently along with their 3rd box set on Numero, so I can keep it up for a few weeks anyway. 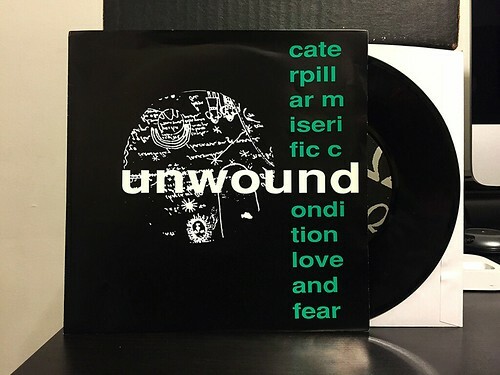 Caterpillar was Unwound's very first 7" on Kill Rock Stars. The fact that this record is 23 years old is kind of crazy, not that I had it way back then. But in 93-94 I was probably at the height of my Unwound fandom and was grabbing anything of theirs I could find. As I had mentioned last week, for some reason I got rid of all of my Unwound records in my mid 20's, but now I at least want to replenish my 7" collection. Listening back on this 7" now, it's very obvious that this is a rough outline of what Unwound was going to become. It's much more straightforward for the most part with some random outbursts of noise. They're definitely going for a more traditional sludgy punk sound in these early days and were only just starting to figure out the kind of band they wanted to be. It's an interesting listen for sure, but at best it's a blueprint for the future of Unwound.